The U.S. Green Building Council's Leadership in Energy and Environmental Design Green Building Rating System™ (LEED) is an important certification for recognizing builders for environmental and public health excellence. 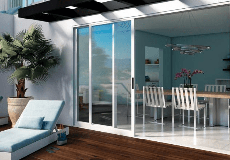 Milgard windows and patio doors can play an important role in obtaining this green building certification. By optimizing energy performance, increasing ventilation and using low-emitting materials, paints, coatings and recycled content, the Milgard family of products can boost your LEED rating. This system encourages the adoption of sustainable green building and development practices, and rewards projects built under these guidelines. While building components themselves are not individually certified, they can contribute to points awarded to a project as a whole. Learn how Milgard windows and patio doors can help earn LEED v 4 credits for energy & atmosphere, materials and resources, and indoor environmental quality here. See how Milgard is incorporating sustainable practices in our manufacturing processes.